What would be the most out of left field news you could get regarding TWD? Besides “Andrew Lincoln is leaving”? We’re getting reports Jon Bernthal has been summoned to appear in at least one episode of The Walking Dead’s upcoming season 9. 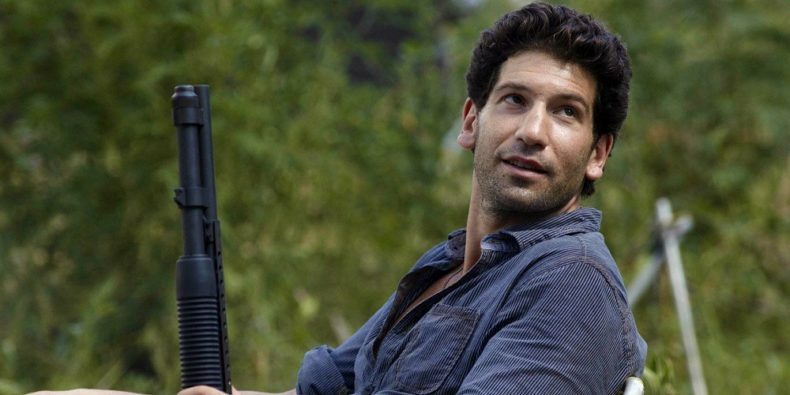 You may have hazy memories of Bernthal, if you go way back — he played Rick’s former friend and bitter rival Shane Walsh in the show’s first two seasons. Rick stabbed him to death in Season 2’s climax after Walsh’s annoying and manipulative behavior crossed one line too many. Last weekend, a fan spotted several cast members from the series hanging around near the Georgia set where The Walking Dead is filmed. Jon Bernthal was among them, and she snapped a selfie with them. It immediately sparked rumors that, somehow, Shane was returning to the show after being dead (and not even a zombie) for over five years. How would that work? The website TVLine, who received confirmation from AMC reps that the return of Bernthal is real, speculates that his appearance is most likely another dream of Rick’s. They also suspect such a vision will appear during whatever episode Rick exits the show in….but in such a scenario, you’d think it would make more sense for Sarah Wayne Callies as Rick’s dead wife to flash before his eyes instead. Maybe Rick finally realized who his TRUE love is. The Walking Dead will return this fall on AMC; Andrew Lincoln has announced his retirement from the role of Rick will occur sometime during Season 9A.